There are few world cultures as storied and as celebrated as that of the Irish. Imbued with a strong religious reverence and an artistic heritage, the influence of Ireland is seen almost everywhere, especially in Celtic jewelry. For centuries, people have taken traditional Irish imagery and designs and have transformed them into beautiful pieces of jewelry – everything from necklaces to earrings to bracelets features the timeless details of Celtic history. Many people, of Irish descent or otherwise, proudly wear Celtic jewelry, not only because of an interest in Irish history but also because it can be absolutely stunning. Perfect for a fancy night on the town or just as fun and casual accessories, Celtic jewelry’s storied history may be just the thing for you. One of the most identifiable symbols used in Celtic jewelry is the Celtic knot. Although many people believe that Celtic knots came from a Celtic-Druidic tradition, it seems more like the circuitous knotwork appeared suddenly in the Celtic community sometime during the 7th century. Many scholars believe that there exists a connection between Celtic knots and Coptic Egypt scribal techniques. Once these primitive designs were adopted by the Christian Celts, they were used as ornamentation on nearly everything – jewelry, weapons, metalwork, and books all contained elements of Celtic knots. Although this type of adornment remained popular throughout several centuries, it wasn’t until the Celtic Revival of the 19th century that designers like Archibald Knox and Alexander Ritchie began creating their own Celtic knots and incorporating them into brooches. Today, Celtic jewelry can be found with many different styles and embellishments. 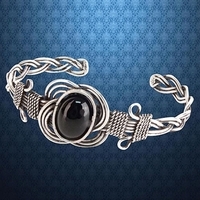 At PearsonsRenaissanceShoppe.com, we have Celtic jewelry for people of all tastes. Whether you prefer a colorful statement piece or a smaller, more subdued look, we have a line of jewelry perfect for you. For instance, our Celtic Brass Earrings are elegant enough to be worn with an evening gown but also not garish to the point of being mismatched with a pair of jeans and blouse. If you are looking for something a little bit flashier, take a look at our Celtic Onyx Knot Bracelet, made of stainless steel wire.